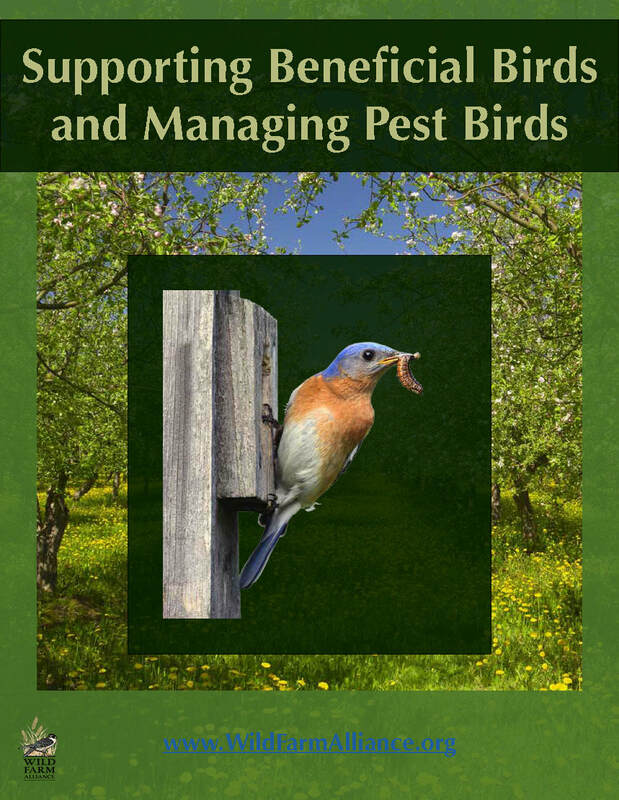 Hot off the press is a new resource for farmers put together by the Wild Farm Alliance (along with myself and Dr. Sara Kross): Supporting Beneficial Birds and Managing Pest Birds. 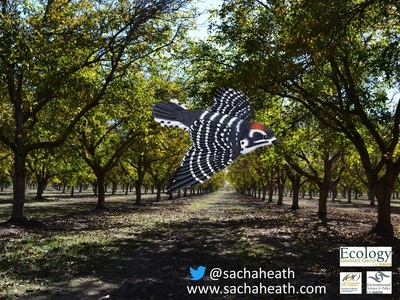 Growers are quite aware of the role that a few pest bird species play on their farms, but are often unaware of the beneficial services provided by many birds species, including insect and rodent control. 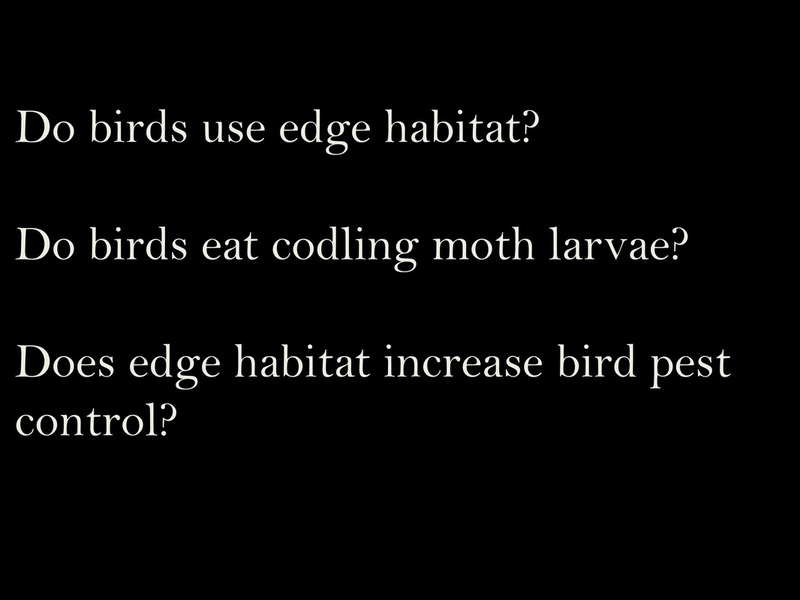 In this guide we summarize results from dozens of ecological studies that have demonstrated significant crop pest reductions by insectivorous and carnivorous birds; in some cases these predatory effects have also been associated with reduced crop damage or improved yield. But ecologists and farmers agree that the story is more complicated than that. In some cases, depending on crop, landscape context, or bird species, the role birds play in reducing pest numbers can be insignificant from the grower perspective, or pest species may have a more damaging effect than do insectivores in having a positive effect. 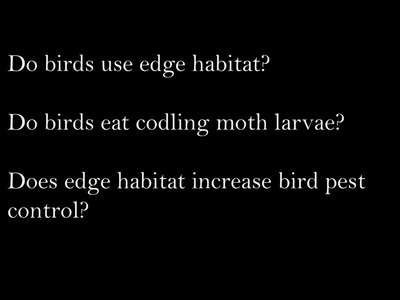 Ecologists are currently quite interested in deciphering this complexity, curious about the conditions under which the predatory effects of birds are most helpful to growers. We are also moving in the direction of trying to determine net outcomes of bird presence on farms. We ask questions about whether the beneficial services outweigh the disservice costs, and under what conditions managers and farmers can tip the balance in the direction of benefits to growers and consumers while also protecting biodiversity. ​The aim of this guide is to distill the current available research into a useful and user-friendly guide for farmers and conservationists alike, with the hope of us all working together to find creative sustainable solutions for conserving biodiversity while also providing humans with the food and fiber we need. 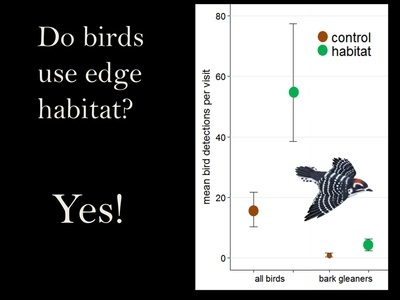 As an ecologist who has used exclosures (Figure 1) to disentangle interactions among multiple species, I often receive emails with basic questions about exclosure construction, net mesh size, sample size needs, and the like. I typically write up a response describing my own experiences, but have often thought it would be nice to have a publication to refer to --one that could provide insight, warnings, and recommendations garnered from trial and error. When I was a Master's student, I certainly could have used such a resource as I wondered how other researchers handled issues that were never discussed in their publications: has anybody else ever had birds get inside their exclosures? What are the pluses and minuses of a particular mesh size? Does anybody else have issues with predatory spiders camping out on their exclosures? Is PVC the best option? Fig. 1. 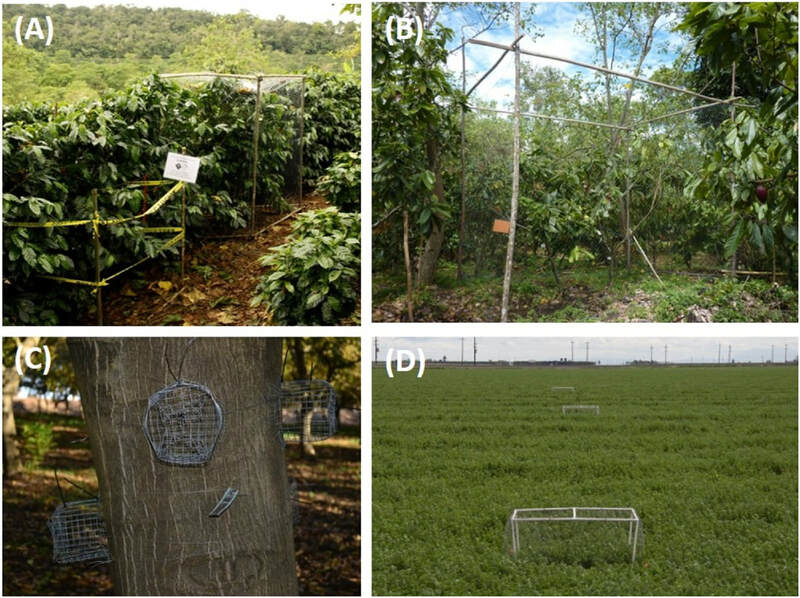 Experimental exclosures of birds and bats in (A) coffee plantations in Costa Rica, ©Daniel Karp; (B) cacao plantations in Indonesia, ©Bea Maas; (C) walnut orchards in the United States ©Sacha Heath; and (D) alfalfa fields in the United States ©Sara Kross. It appears that a handful of other ecologists have had similar experiences, and Dr. Bea Maas decided to helm the effort to do something about it. The result is our recent collaborative publication in Basic and Applied Ecology where we discuss methodological insights, potential improvements, and cost-benefit trade-offs of exclosure techniques. ​Our hope is that this will be a useful resource for graduate student and seasoned researchers alike. Head on over to my publications page to request a reprint. Maas, B., S. Heath, I. Grass, C. Cassano, A. Classen, D. Faria, P. Gras, K. Williams-Guillén, M. Johnson, D. S. Karp, V. Linden, A. Martínez-Salinas, J. Schmack, and S. Kross. 2019. Experimental field exclosure of birds and bats in agricultural systems - methodological insights, potential improvements, and cost-benefit trade-offs. Basic and Applied Ecology 35:1-12. I am very happy to announce that I have been selected to be one of four Biodiversity Postdoctoral Fellows with the Living Earth Collaborative! The two year position starts in June and I will be based in St. Louis, Missouri. I am venturing into the world of Urban Ecology and have the opportunity to study conservation effectiveness along a rural-to-urban gradient. 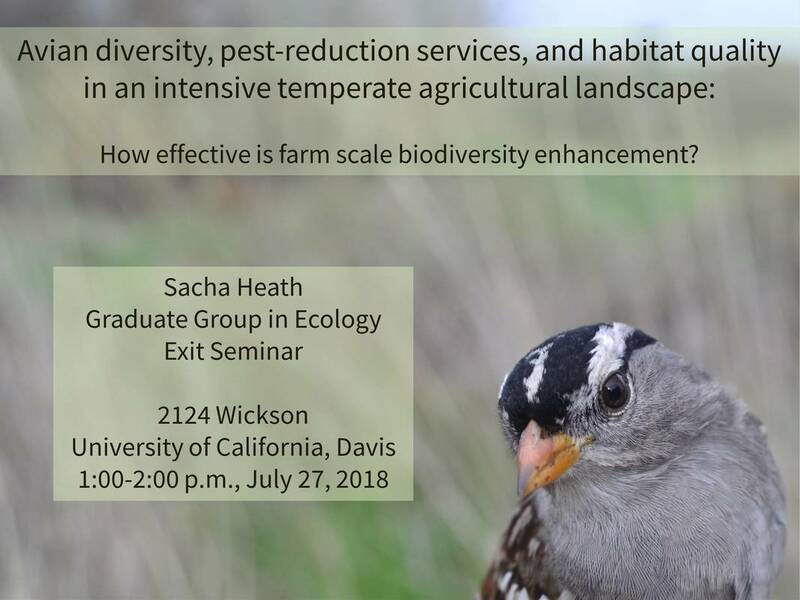 I'll be thinking more about the interactive effects of multiple spatial scale features on avian diversity patterns, predation risk, and trophic interactions, which ties in quite nicely with the research I've been doing in agricultural landscapes. 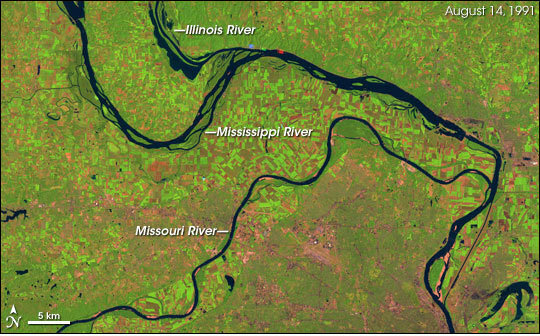 True to the LEC's mission, I will be collaborating with the lab of Gerardo Camilo (St. Louis University), and Solny Adalsteinsson (Tyson Research Center, Washington University), Anne Tieber (St. Louis Zoo), and St. Louis Audubon. I'll post more information as the project develops and progresses. Having spent very little time in any mid-western U.S. state, I am indeed a Pacific vagrant in the Mississippi Flyway. Click the image to interact with the flyways at Audubon. 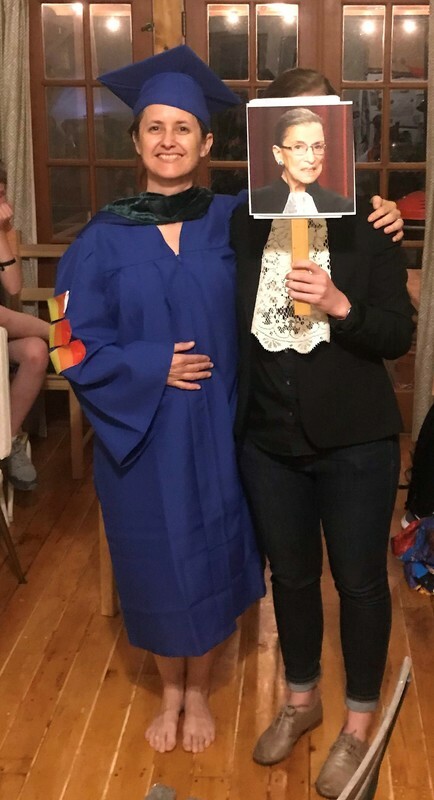 I was honored to have this very special guest as the commencement speaker. ... my spouse and I packed up our lives and our menagerie of domestic animals and headed east to St. Louis, Missouri. Maris is now a Research Fellow with the Institute for Conservation Medicine and we are settling in to life at the confluence. 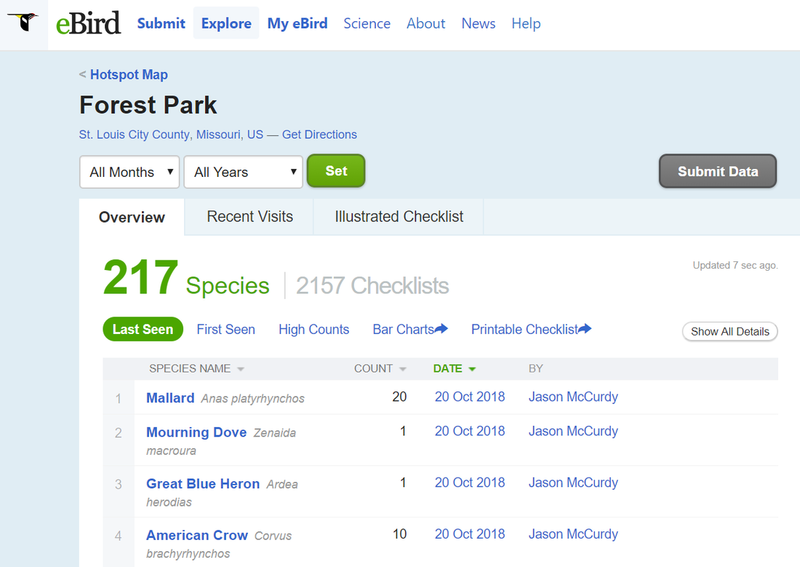 We made it just in time to greet fall migration and my head nearly exploded with the wonders of migratory warblers descending en masse on some of the greatest city parks I have ever been lucky enough to enjoy. 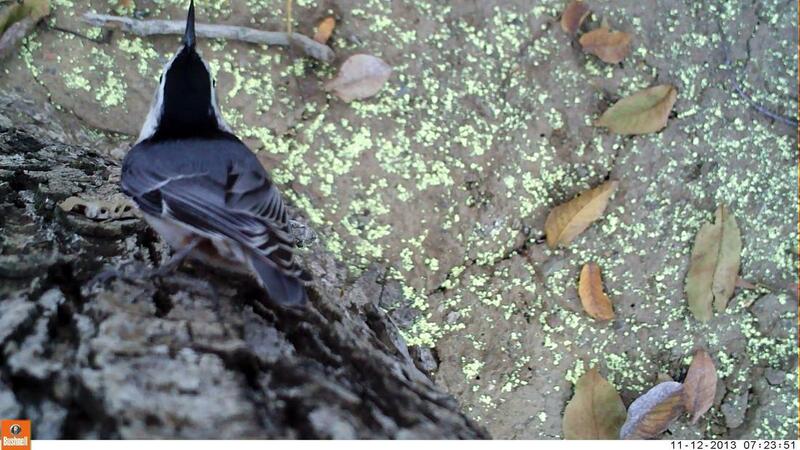 Click to see what birds have been seen at Forest Park! 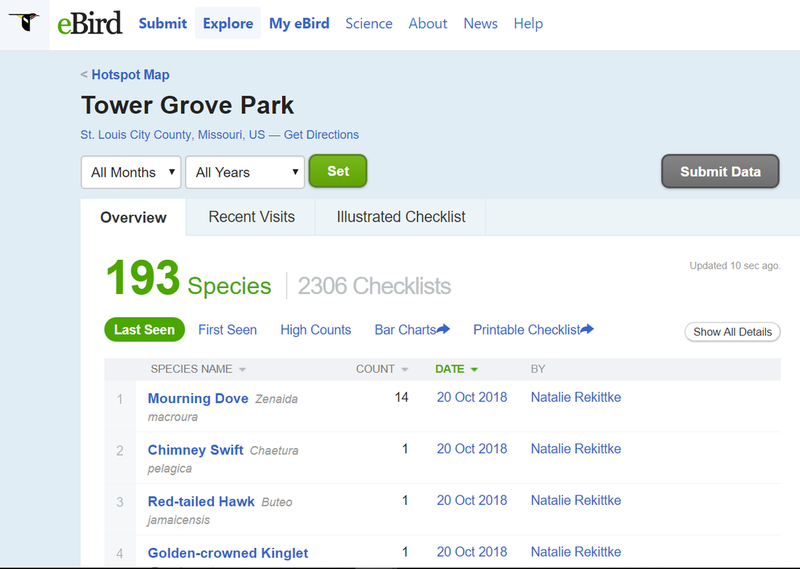 Click to see what birds have been seen at Tower Grove Park! Birding, and exploring the incredible Missouri Botanical Garden and some of the numerous Missouri State Parks within driving distance from St. Louis has been just what this long term student has needed. Alas, it is now time to buckle down, submit those last two chapters, and find a job! 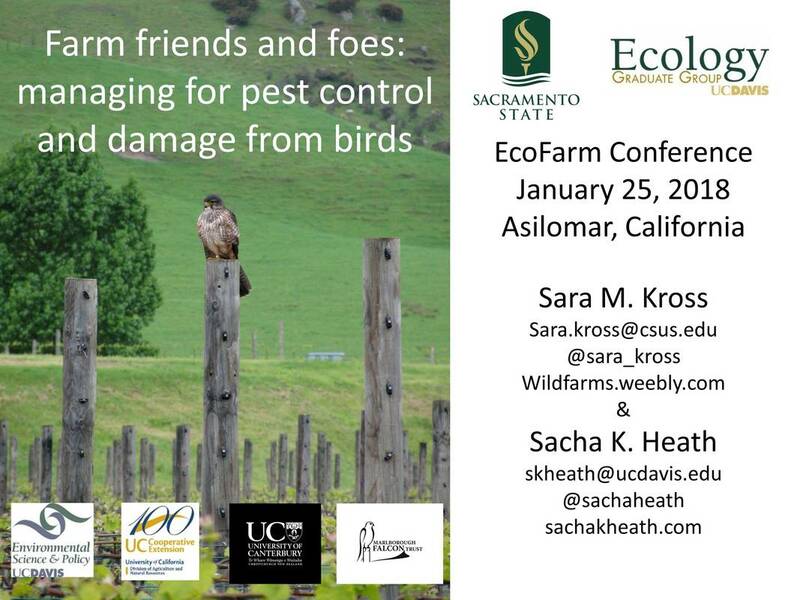 My compatriot in all things farm and fowl, Sara Kross, and I co-presented at EcoFarm 2018 this past week. In attendance at our workshop were about 80 folks, mostly growers and a few NRCS staff, who all had great questions and comments based on their own experiences in the farming trenches. ​I think the audience and I were a bit in awe of Sara as she presented her material with her 3 week old strapped to her body. It reminded me of how far we've come as women scientists. No longer do we have to choose between work and family, unless we want to. I appreciated EcoFarm accommodating Sara and Quinn in the many ways they did, and the audience for being so welcoming, kind, and face it - understanding of reality. Though there have been improvements, there are many professional society meetings which still make it quite difficult for parents to bring their kids to conferences (yup, all parents are responsible for their kids! ), despite this accommodation seeming like a pretty low hanging fruit when it comes to equity in the sciences. Why is it so hard to publish about women's issues? 45 authors, all mothers-in-science at different career stages,1/4th URMs collaborated on fantastic piece on HOW TO SOLVE inequitable issues mothers face when trying to engage at/attend conferences. But having trouble publishing! Publishing solutions for this very issue seems like a pretty timely and important thing for a journal to take on. It's just not that radical, folks. We ended our conference at the the glorious Asilomar grounds with a little birding and beach walking. A much needed break from the dissertation grind. 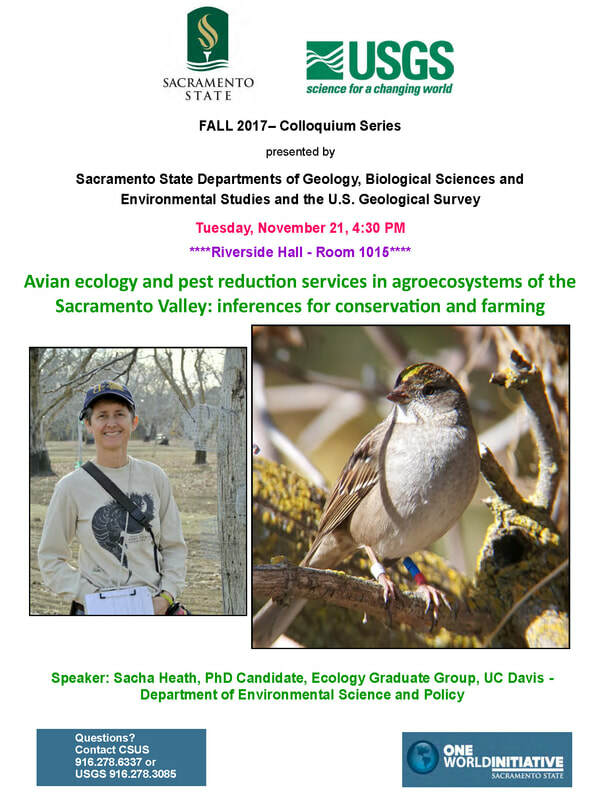 I'll be talking about, you guessed it, birds and agriculture, tomorrow for Sacramento State's Fall 2017 colloquium series. The series is put on for undergraduate students by the Geology, Biological Sciences, and Environmental Studies Departments, in collaboration with the U.S. Geological Survey as part of Sac State's One World Initiative. I love talking to students about science and birds and agriculture. Should be fun! My interview with Local Dirt Radio about my research was on air this evening. I hope you enjoy the discussion!